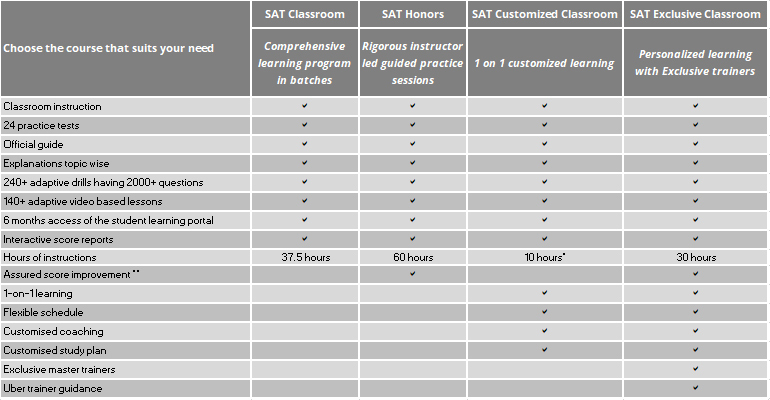 As its name suggests, the Manya-The Princeton Review’s SAT Exclusive course exposes you to our most experienced (Exclusive) trainers who have extensive experience in SAT coaching and have an exceptional success rate. The course is available in both classroom and online modes. Under their esteemed guidance, you can be assured of the most value creating and rigorous learning experience. The Exclusive trainers enable students to solve even the most difficult and tricky questions with ease within the stipulated time frame. If you prefer individualized learning with the exclusive trainers at your preferred timings, then you have arrived at the right page.